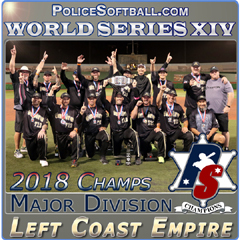 The 12th Annual Police Softball World Series was held at the Big League Dreams facility in Las Vegas, Nevada on the 2nd weekend of October, 2016. The theme of the event was the “changing of the guard” as several established teams were feeling the heat of the young guns breathing down their necks all season. The youth movement was far more prevalent this year than in the past so of course, ps.com decided to market that angle. It was no longer about East vs. West, as the cyber-friendships created by social media killed that rivalry. What it didn’t kill was the inevitable changing of the guard. Older, established teams were classified as being Legends of the Old Guard, while the newer teams were simply referred to as the New World Order. Garrett Metal Detectors once again hosted a player reception at the host hotel, the Golden Nugget and it was attended by over 300 players who arrived early. This year was a very somber year for law enforcement as we suffered many on-duty deaths and have endured an unprecedented lack of support from governmental officials and the public as a whole. Although most of the officers know that the majority of the public still supports them, the anti-police rhetoric by certain organizations along with the deafening silence by some of our nation’s highest leaders has definitely taken a mental toll on the men and women who pin their badges on every day. The player reception was a great way to unwind and reconnect with fellow cops from all over North America. For one weekend we were able to escape all the hatred and simply play the game with and against other brothers in blue, which is known in our circle as the Thin Blue Line. A new division was added this year to accommodate the teams who were too good for the Gold Division but not quite the caliber of the Majors teams. For those “tweeners” we created the Mid-Majors. On Thursday morning the round robin kicked off as each bracket was mix/matched with one Majors team, one Mid-Majors team and two Gold teams. There were a few upsets but generally the teams that were projected to win did so. Just to prove how spot on we are with our classifications, of the 16 Majors teams, only one suffered a loss to a Mid-Majors team. And of the 16 Mid-Majors, only 2 suffered losses at the hands of Gold teams. The 29-3 record of the two major in inter-division games told us the additional division was right for our event. The Opening Ceremony was held on Thursday night and once again the attendance was phenomenal. Empty seats were hard to come by as the guests were treated to the presentation of Colors by both the Las Vegas Metro Police Department Honor Guard, and for the first time ever, a Canadian Honor Guard comprised of players from the Ontario Province. The playing of taps this year was especially poignant as we had just learned of the murders of two officers and sadly, we would soon learn about the murders of two more before the series would be over. The year-end awards were presented and several Hall of Fame inductions were made. The Dr. Charles Garrett Memorial home-run derby finalists were Tyler Clawson from the Mid-Atlantic Lawmen and Luis Velazquez from the LA Lawmen. To understand just how good Velazquez is, this was the third consecutive year he was a finalist. Nobody has ever been a finalist two years in a row, but Velazquez has done it three times. Considering there are always over 70 participants that is simply amazing. Although Clawson gave him a good fight, King Velazquez was too much to handle, and for the 2nd time in 3 years Velazquez wore the HR crown. It was a lucrative prize package as Velazquez received a new bat from Easton courtesy of Brett Helmer, a Thin Blue Line watch courtesy of Paul Chavez and Rockwell Watches/Elite Movers, and a 3 night stay at the Golden Nugget for the 2017 World Series courtesy of Garrett Metal Detectors. Vaughan Garrett himself presented Velazquez with the crown. The highlight of the night was the Legends vs. Futures (aka nWo) All Star Game. In my previous installment of the Cop Corner, I announced who the national all-stars were and how Brett Helmer would captain and play of the Legends. Denny Crine from Miken was slated to captain and play for the nWo but he suffered an injury earlier in the year and was replaced by Jason Kendrick. Both Helmer and Kendrick were able to display their significant power, but the game itself was tight with the youngsters seemingly having the advantage going into the bottom of the last inning, which was an open inning. Pitching for both teams was outstanding and the Legends closer Butch Crozier from NYPD Blues kept the nWo at bay and allowed his team to be within striking distance in the bottom half. Corey Rogerson did his best to close it out but the Legends had something left in the tank, and a 3-run homerun by Butch Castor of the Ohio Lawmen tied the game. With the winning run at the plate, Rogerson reached into his bag of tricks and delivered a wicked “heater” low and away to end the game with a strikeout. After all the propaganda and hyperbole leading up to the game, it ended in a tie. Although the players might disagree, it was the perfect finish. MPVs of the game were Ohio Lawmen’s Rob Menke and the NY Hounds Duke Settoducato. They both received Thin Blue Line Coliseum watches courtesy of Paul Chavez courtesy of Elite Movers and Rockwell Watches. The favored teams were San Antonio Law, Iowa Lawmen, Lonestar/NEP, and of course Chicago Metro. All played well, and as always Chicago Metro had the largest fan base. Although they lost an early game they battled through the loser bracket and seemed destined to make it to the final dance, until they ran into the Cinderella story known as the Texas Guns. The Guns were almost an afterthought, a team that nobody predicted would be anywhere near the final teams standing. They were a combo team of players from San Antonio and Dallas which is a region where the top talent was already picked apart by teams such as Team Texas and San Antonio Law. But this scrappy squad was resilient. They gave Chicago everything they could handle and more. The game was symbolic of the battle for the Alamo, but they dug their heels and protected their fort. They shocked Chicago by holding them off and advancing to the final three. The Texas Guns were now on the national map! The other shocker was a team nobody ever heard of, the Northern Lawmen out of Ontario, Canada. These were the same guys in the Honor Guard, but nobody knew they could play ball so well. They stormed through the playoffs and eventually sent the Texas Guns home, albeit with a very impressive 3rd place finish. Although Canada is known most for hockey, those in attendance recognized that Canada also has some serious softball talent and many of those players were wearing Northern Lawmen uniforms. 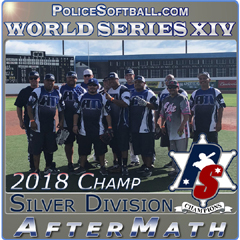 Their first impression of the police softball circuit was more than impressive as they advanced to the championship game against San Antonio Law. San Antonio Law was projected to win this division based on their past success at the World Series. Things did not go as planned for the team this year as their merger with Team Texas proved to be an epic failure. This left San Antonio scrambling to pick up the pieces and rebuild on short notice which they did. Their hurdle? They had not played together as a full team and there were concerns about chemistry, the very issue that derailed their merger with Team Texas. This time, they hit a home run (literally). They went undefeated through the playoffs and faced the new comers the Northern Lawmen in the championship. 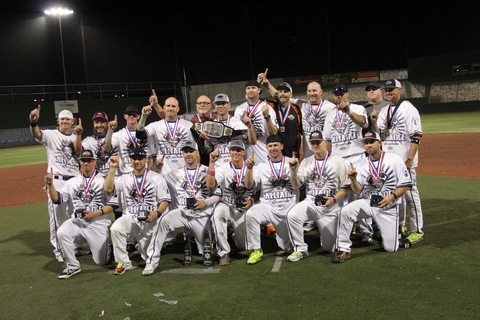 It was a very close game all along, but in the bottom of the 7th team leader Rafael Trinidad launched a walk-off home run to win the game and give San Antonio Law their first World Championship. It was a very emotional moment for Trinidad as less than one-year earlier he had been diagnosed with kidney cancer. It was a magical considering just a few months earlier he had been fighting for his life. His teammates popped champagne bottles and celebrated their victory, while Trinidad celebrated not only victory, but the gift of life. He had defeated cancer and won a World Championship, which is why the team selected him for the Pat Hill Inspirational Award. This was somewhat of a controversial division since it was the first year of its implementation. Some felt all 16 teams should have played up in Majors, while others thought the majority should play down in Gold. This is exactly why we created Mid-Majors, because they are the teams that didn’t really fit into either the higher OR lower brackets. In hindsight, it was an outstanding decision as this division featured teams of similar caliber and most of the games were nail biters. The forecasters were dialed in with the projections in this division. Two powerhouses, Team Texas and Stanislaus Combo delivered as expected. Meanwhile, the LA Lawmen and Honolulu’s Finest performed admirably, but finished lower than many had anticipated. Of all the teams in Mid-Majors, none wore the title of “sandbagger” more often than Stanislaus. They have been a perennial powerhouse in Gold, but competed with mixed results in Majors. History would prove they are the poster-child for the Mid-Majors Division and they did not disappoint. To begin with, instead of resisting the title of sandbagger, they owned it. They donned jerseys sporting the name “Professional Sandbaggers” on Thursday, and then they proceeded to mow down the competition as expected. Their big statement was against last year’s Gold runners-up, Honolulu’s Finest. Stanislaus bested the brudda’s from Hawaii in a very close game and eventually tapped out in 3rd place. The Pennsylvania based Thin Blue Line was lights out all tournament and forced an “IF” game against Team Texas. They definitely had the momentum after soundly defeating Texas in the championship game but they ran out of steam, and into a possessed Team Texas in the “If” game before finishing, in impressive manner, as runners-up. Team Texas has been one of the solid Majors Division teams since 2006 and they did not like their reclassification to Mid-Majors. Majors was condensed down to 16 teams, and Team Texas entered as the #17 team. They used the snub as motivational fodder and did what they were supposed to do. Win the World Championship! They did lose one playoff game to Thin Blue Line but they came out like a buzzsaw in the “if” game and cut through them like a surgeon. 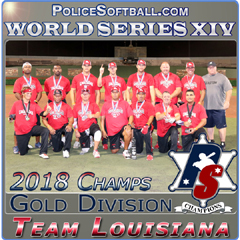 Team Texas sent a message to the police softball circuit…never sell them short. They now have all year to celebrate their well-deserved World Championship, and enjoy their promotion to Majors once again. This is the heavyweight division, and since it was condensed down to 16 teams, only the top 16 ranked teams in the nation made the cut to do battle on the big stage. Depending on who you talked to, the belief was anywhere between 8-12 teams had a legit shot to win the heavyweight title. One of the teams not in that discussion was West Coast United who were hovering around the 13-14 projected finish going into Series. This NorCal based team is loaded with young talent and everyone knew their day would come, but few felt that day would be today. West Coast United wore the glass slipper for a while as they eliminated heavily favored teams such as DEA Combo and Battleborn before finally tapping out in 4th place. It was a historic moment for the young squad and they will certainly build on that in the future. One of the fan favorites was the Minnesota Lawmen who have a 20+ year history in the sport. They have never missed a World Series and although they typically start the season slow, they always ramp up come October. These guys draw players from a very small talent pool. Although Minnesota is a large geographic region, their population is a fraction of other states they are competing against. They did not disappoint. They sailed through the playoffs but were eventually handed two losses at the hands of the 4-time champions SoCal Alliance and finished in 3rd place. Minnesota Lawmen definitely represented the Land of 10,000 Lakes with honor. The final two teams standing were not strangers to the big stage. The NYPD Blues were World Champions in 2010 and have been one of the top teams in the nation since the 1990’s. Across the diamond stood the SoCal Alliance, four-time World Champions and a team that had not lost a single game all year. You could not have scripted a better matchup featuring the Beasts from the East against the Best in the West. It was Yankees vs. Dodgers all over again. The undefeated game went back and forth with the NYPD Blues eventually winning on a controversial call that ultimately led the competition committee to make the ruling. That placed the NYPD Blues in the Championship game once again and it meant the Alliance would have to work their way back and try to double dip the Blues. The Alliance earned their ticket back to the dance but they appeared to be reeling. The Blues had the game in hand and were plus 10 going into the top of the 7th. Somehow the Alliance tapped into their magical superman “S” and pulled off a miracle by plating 13 runs! The Blues did not answer in the bottom of the 7th which forced an “IF” game. In the “IF” game the Alliance maintained the hot hand and defeated the NYPD Blue to be crowned FIVE-TIME World Champions! (No team has ever won it twice, but the Alliance has done so FIVE times). In the ultimate “microphone drop” the Alliance management announced the team would be folding and they stepped off the stage as World Champions. 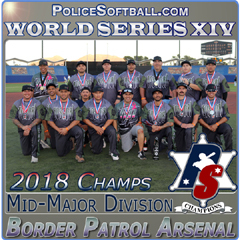 Peyton Manning has nothing on these guys, as they are the undisputed best police softball team of this era and it is unlikely any team can ever duplicate what they accomplished during the past 15 years. *Note: This was a bittersweet moment for me, because my friend Del Pickney and I created this team in late 2001 and it was our legacy. 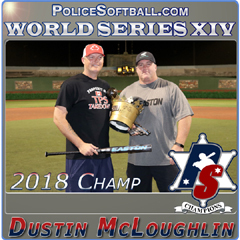 We turned the team over a few years ago in order to focus on the broader task of running the World Series and the www.policesoftball.com managerial duties. But, make no mistake, I will always bleed Alliance orange. I want to personally thank every player and coach who has ever represented the Alliance brand. You made magic and only those who experienced it can understand what I mean. To close out the tournament on Sunday there was a Masters (40+) tournament along with a Women’s tournament. Terry Dugan from Lockdown Sports sponsored the event and provided the prize package which included his signature edition Demarini Lawmen bats. Terry also supplied Miken seniors bats for the event and Hall of Famer Keith Benjamin supplied Louisville Slugger seniors bats. Both brands were a big hit and balls were flying out of the park on all fields. 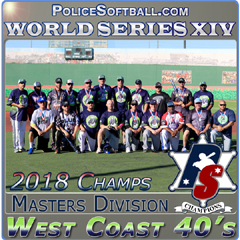 When the dust settled in Masters, it was once again the West Coast 40’s who claimed the title with Tyson Becker being named MVP and Rick Bass, Keith Habig and Bryan Schmidt being named All World. Keith Habig received the Pat Hill Inspirational award. In the Women’s division it was once again the Sin City Betty’s who were declared champions. Trish Speaker was named MVP with Tami Habig, Shelbie Medrano and Jaci Carlson being chosen as All World. Brittany Burney was named the Pat Hill Inspirational player. So how did the battle between the New World Order and Legends of the Old Guard pan out? The nWo delivered some body blows but it was the Legends who delivered knockout punches in all divisions. The winner and STILL champion is the Legends of the Old Guard! Better luck next year youngsters. We had incredible prize packages divided among the top teams in all divisions that ranged from brand new Easton Stealth bats, Easton back packs, Easton batting gloves, Rockwell Thin Blue Line Coliseum watches, over $2000 script from Elite Sports, Demarini Lawmen bats, 3N2 Sports jackets, hats and sliders, Obelisk statues, championship medals etc. I am sure I have missed some but a massive THANK YOU to the following. Brett Helmer and Easton Sports, Garrett Metal Detectors, Denny Crine and Miken Sports, Carlos Vega and Elite Sports & Dudley, Dennis Leonard and 3N2 Sports, Terry Dugan and Lockdown Sports, Keith Benjamin and Louisville Slugger, Ernie & Nicole Ono and USSSA softball, Chris Devlin and the Big League Dreams staff, Paul Chavez and Elite Movers/Arpin Van Lines, Rockwell Watches, Fit Republic of Las Vegas, the Las Vegas Metro Police Honor Guard, the Northern Lawmen Canadian Honor Guard, Craig and Caleb Singleton, Tracy Morgan and the Golden Nugget Hotel-Casino, Anthony Costanzo/Kevin Mickelson & Sacramento County Deputy Sheriff Association and Softball Magazine. Also, it takes a lot of volunteers to make it all happen so a special shout out goes to: Kevin Schoch, “The Voice” of police softball Mike O’Neill, Mike Riches, Pete Salvaggio, Norm Coe, Ron Peeler, Tyson Becker, Matt Woolf, John Erven, and the Police Softball Competition Committee. 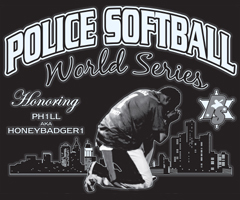 We have requested the 2nd weekend of October in 2017 at the same venue for the 13th Police Softball World Series. This year we turned away teams and we expect to do so next year. When we open it up for payment, be sure to reserve your spot ASAP. Is 13 your lucky number? Don’t miss it! WORLD SERIES XIII COMING SOON!